There's a NEW BIG SHOT in town! 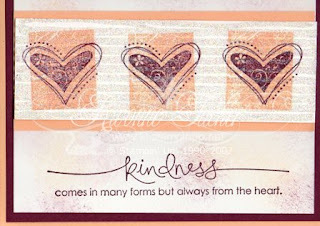 There's a new big shot in town--the Sizzix Big Shot for Stampin' Up! The Big Shot is a sturdy manual die cutting machine used to die cut materials for use on crafts, home décor projects, and even clothing--it's a big deal! You'll love what the Big Shot machine, a 6-time winner of Creating Keepsakes Reader's Choice Award for best die cutting equipment and dies, can do for you. Design your own custom pillow appliqués using the Tulipe Bigz die or make custom fabric flowers to embellish a quilt. From sewing to quilting to home décor, the Big Shot is the perfect tool for many types of crafting. The wide appeal to various types of crafters will help you expand your business in new circles. The Big Shot makes incorporating paper crafting into these customers' hobby an easy progression. Use our Stampin' Up! exclusive dies to create die cuts and stencils with our artwork and designs for all your craft needs. Planning and preparing Make & Takes is fast and economical with the Big Shot machine. Cut out eight of the same chipboard letter or 20 scalloped pennants in just a few minutes. You'll be able to cut and score 3-D items in seconds, and the projects will be ready for your customers to enjoy. 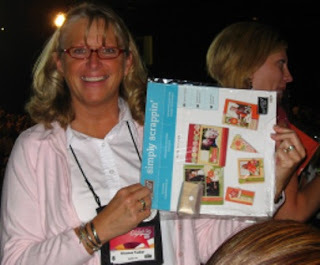 Or create embellishments for cards, scrapbook pages, or any other type of project by cutting multiple images at once. Be looking for this great machine in the Holiday mini caddie! I ordered mine Big Shot on Monday. I am so excited to play with it! My open house will be on Saturday August 23rd from 9-noon. Stop by my house ~ free make and takes, take a look at the New catalog, have some Starbucks coffee, and enjoy friendship! I had a great time at convention. I got a bracelet that was purple. Purple is my favorite color. I knew it would bring me luck! The last day almost the last activity, they showed the purple bracelet on the big screen. I was so happy! I won a simply scrappin kit and the new Calendar Alphabet and Numbers. Jaron did a great section on scrapbooking and I am excited to tryout these ideas with my new supplies. This was one of my trades at convention. I had glitter all over myself making 50 of these. I decided I was going to be the glitter queen and all my cards were full of glitter! As the days go one I will do more show and tell! I had sooo much fun and had to come home and sleep for days! Stay turn for more stuff!